You WILL notice results after your first session! Twilight Teeth is quickly absorbed during your tanning session and whitens effortlessly while you tan. For best results, teeth should be clean before treatment and you should not eat or drink for 15 minutes after your tanning session. Twilight Teeth starts working in as little as six minutes. 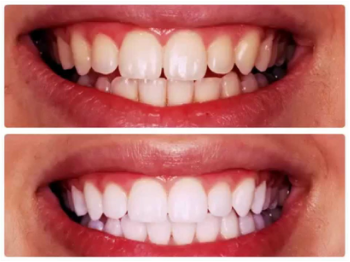 Click HERE to view a video on the Twilight Teeth whitening system! Twilight Teeth’s patented No Rinse Process was the first on the market to bring you the same whitening process used in dental offices. There is no need to spend another dollar on expensive teeth whitening procedures or on messy pastes and films at the drug store. Each Twilight Teeth kit gives you up to 12 applications and is guaranteed to deliver whitening results superior to any other over the counter product you can buy. Your Twilight Teeth kit comes with a comfortable mouthpiece, application gel, and a whitening light for at home teeth whitening. This powerful little light makes using the whitener gel convenient for those who do not use tanning beds and is great for at home touch ups. This convenient, no-rinse process allows you to go about your day the moment you remove the mouthpiece.